In preparation for our big day next June, I asked the special ladies in my life if they would join us as my bridesmaids! I had such a fun time putting together these special boxes for them, and it is easy to get all of these items if you are looking for ideas. I packaged all the goodies together with white paper crinkle, and gold foil dot tissue paper from Paper Source. The boxes I also found at Paper Source, and to complete the entire look, I wrote each bridesmaid's name on top of the box in calligraphy and tied the box with a peach ribbon. You can customize your boxes by using your wedding colors for the various items, or including something that is unique to your wedding (i.e. sunglasses if you're getting married in the summer, mini wine bottle if you're getting married at a winery)! 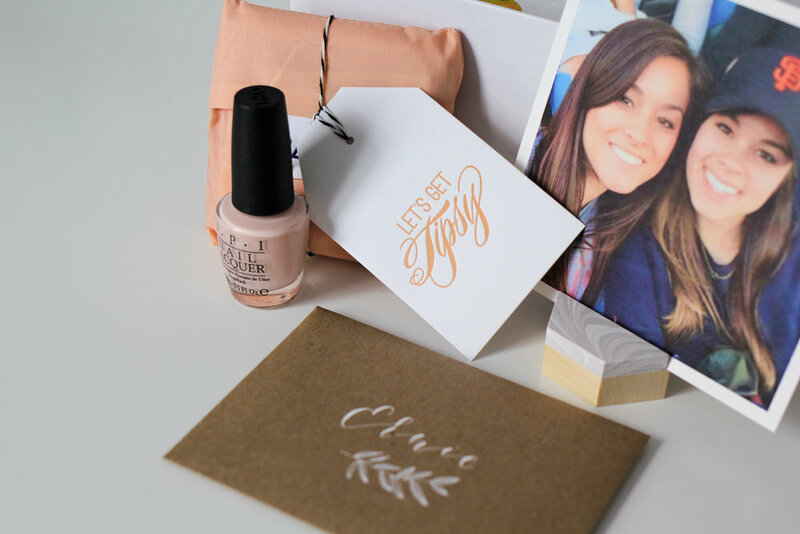 Or if your budget is tight, simply write your bridesmaids a heartfelt card telling them how much they mean to you and how honored you would be to have them in your wedding... because let's be honest, that's the part that counts the most. have fun creating your bridesmaid boxes! I'm excited and honored to be included in BHLDN's grand opening in Walnut Creek on Thursday, October 6! This wedding fair is being held from 6 pm until 9 pm, and will feature talented vendors from around the Bay Area including Jasmine Rae Cakes, The Black Tux, Absolute Celebrations Catering, Sacha Badame Styling & Makeup, Florali, Trynh Photography, and Ivy Hill Entertainment. This event is a perfect excuse to bring your closest friends, mom, and bridesmaids to browse dresses and wedding accessories with you! Space is limited, so RSVP here and come say hi to me when you get to the store.